Angela Marsons is a British author who is known for her DI Kim Stone crime mystery novels. I came across her novels when I was searching Bookouture, the British book publisher for new reading ideas after having read Robert Bryndza’s DCI Erica Foster series. After reading Angela Marson’s books as well, I have to admit Bookouture is slowly becoming a favorite book publishing house. Also, after reading the latest seven books, I believe that reading the Angela Marsons books in order is recommended. Not a must, but recommended. Here are Angela Marson books in order for her beloved DI Kim Stone series. The book list will be updated with any new novels the author will be writing in the future. Angela Marsons is a British crime mystery author who is living in the Black Country in the West Midlands in England. Her love of writing came to her during Junior Highschool when she realized that silently watching other students and making up fun stories about them is more interesting than focusing on her own homework. She wrote a short story titled “On the rocks and the seas”, which was positively reviewed. During her younger years, Angela Marsons wrote many stories, which would invariably end in the desk drawer. After a friend urged her to publish some of her work, she entered the Writer’s News competition with three short stories, one which ended in a win for the author. Her first books were written character-driven stories about relationships, novels which she self-published under the titles My Name Is, and The Middle Child. Both books have been republished under the new title The Forgotten Woman and Dear Mother. Eventually, she moved on to writing crime mystery novels, and the DI Kim Stone series lovers are extremely grateful for her switch to the genre. After 19 years, Angela Marsons was made redundant from her job as a security guard manager at Merry Hill Shopping Center, so with money tight, especially since her partner, Julie, was recovering from a surgery at the time, she finally decided to become a full-time author. She is a writer whose dream finally came true. Angela Marsons began writing her Kim Stone books in 2011 but they were rejected by all traditional publishing houses until Bookouture came along and made her an offer that shot her almost immediately to world fame. When Angela does her research before writing a new story, she buys books on the topics and her research is always factual. She is never far from her PACE Manual, which is the Police and Criminal Evidence Act manual and the codes of practice, along with several books on Forensics, and regularly checking the internet for factual information. I found it interesting that she also researched Archaeology, Osteoarchaeology, Post Mortem procedure, as well as various torture methods for her books. 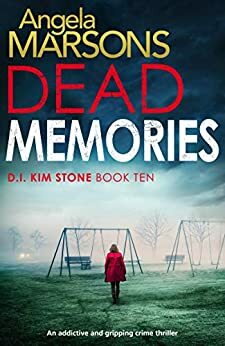 Currently, her Bookouture contract started in 2014 consists of writing 8 books for them – and I sincerely hope the DI Kim Stone series will not end there! Her first three books in the Kim Stone police procedural series were released in the same year, in 2015 and they all became Amazon top sellers in their category. Book #4, Play Dead, was published in 2016. 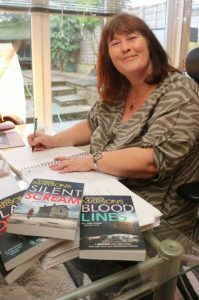 Silent Scream, Angela Marson’s crime mystery debut novel sold over 900,000 copies very fast and became an Amazon bestseller in position #1 for over a month in the UK and had a position of #5 on the US Amazon charts. Her next books also reached the Amazon top charts and Blood Lines, the 5th book in the Kim Stone series, Blood Lines went straight to place #1 from the very beginning. The latest Angela Marsons book, Dead Memories, is published early 2019. The book brings back some horrible memories from the time Kim and her brother, Mickey, were children and terrorized by their parents. Angela Marsons secured the rights deals for her Kim Stone books in several countries, including Germany, Italy, Norway, Russia, Poland, Lithuania, Hungary, Czech Republic, Slovakia, Turkey, Greece, Japan, France, Vietnam, Portugal, Iceland, Sweden, Spain, and Estonia. The deals were even for translating into Arabic languages. Kim is a formidable character, with a lot of issues stemming from her past. She is not always very likable and sometimes sorely lacking social skills, but she is a very passionate person who is always driven to solve her cases. Kim had a hard childhood, she grew up in difficult conditions, was in an out of the care system, so she is quite compassionate towards those who have it harder than she has. Also, she is not looking at prostitutes with the same eyes everyone else does. She knows that many of them have no choice or were forced to do what they are doing and can’t see any way out. The Angela Marson books are not only serial killer thrillers but also psychological thrillers with very dark themes involved. They usually go deeper into the motivations of the killers and what drives them to do their awful deeds.